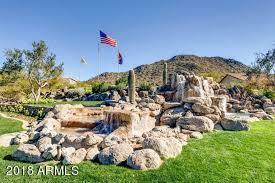 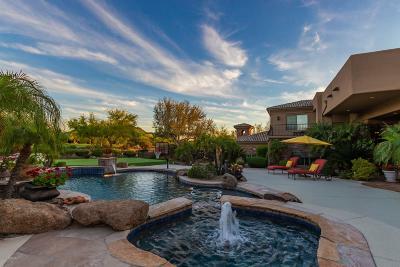 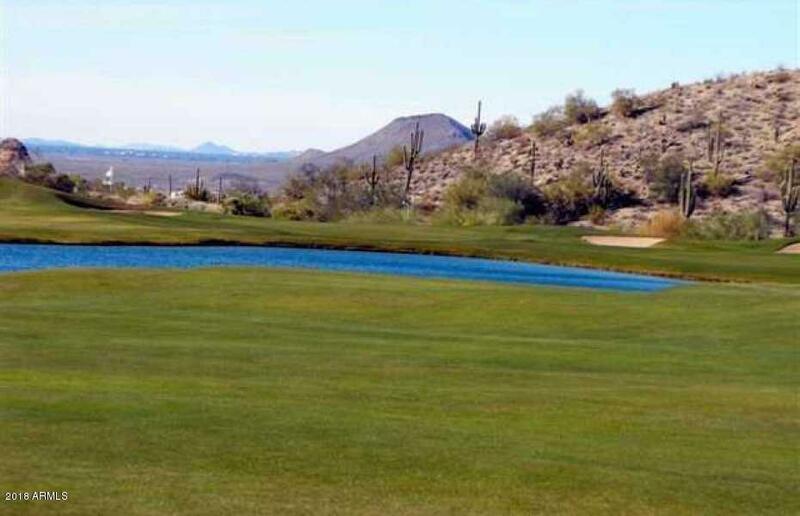 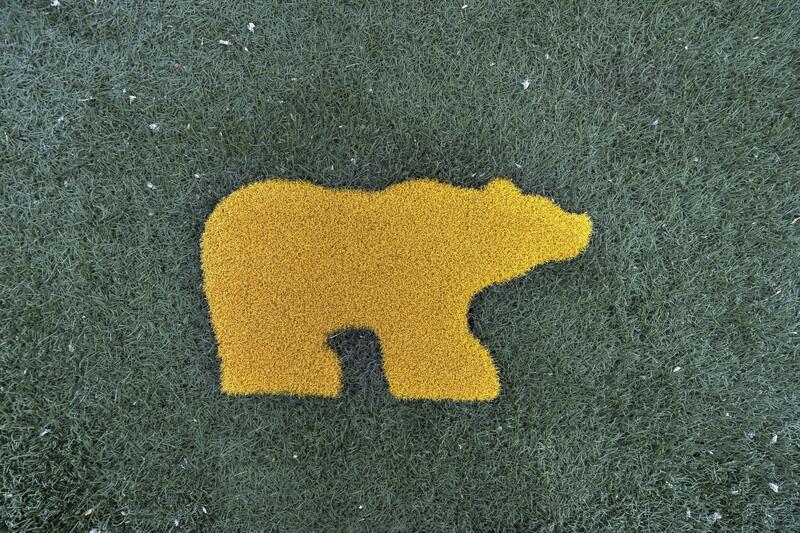 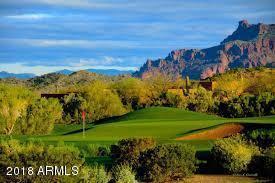 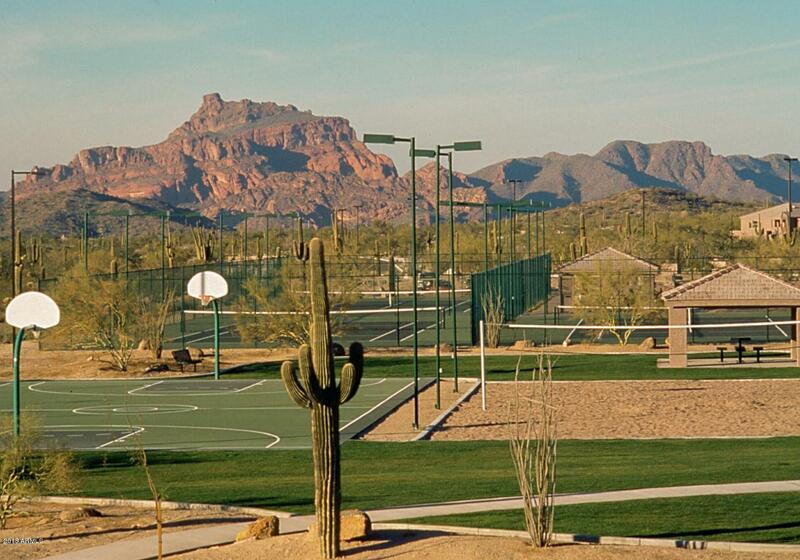 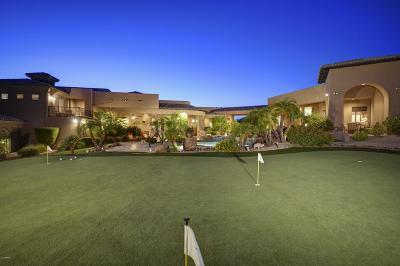 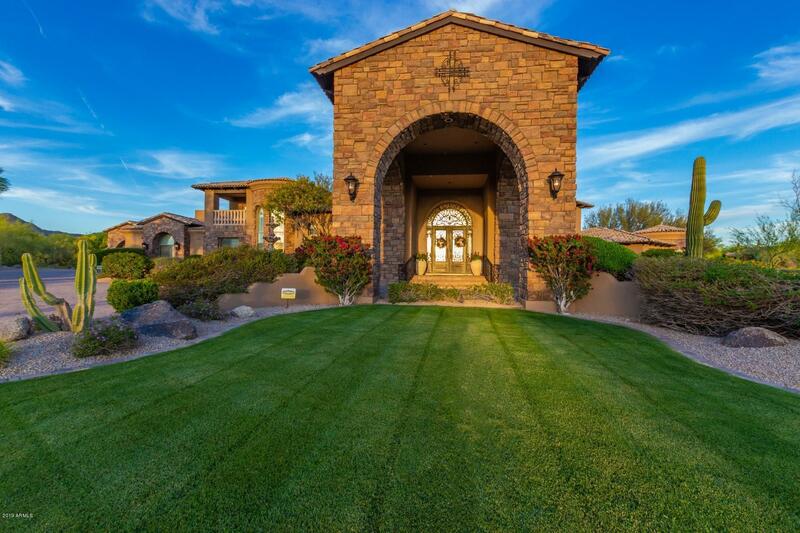 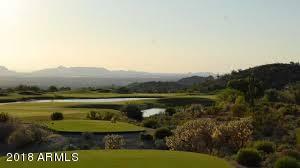 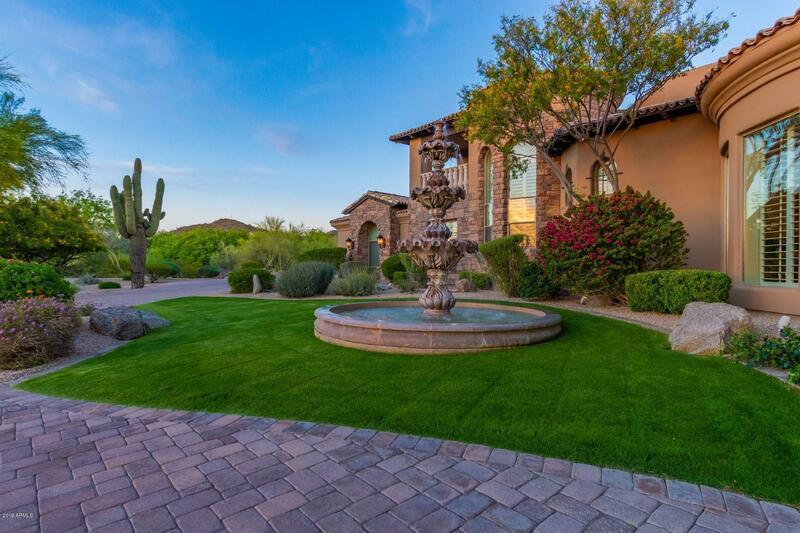 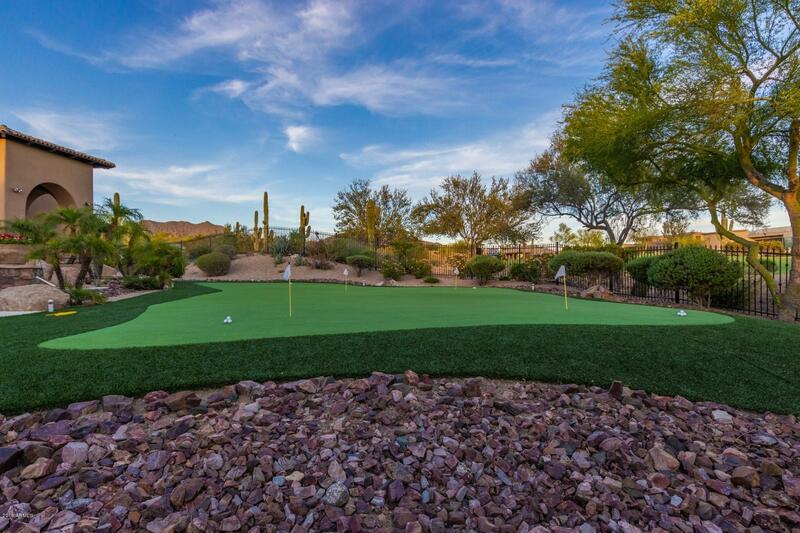 ***PLAY YOUR OWN 5-HOLE GOLF COURSE ON PROPERTY**! 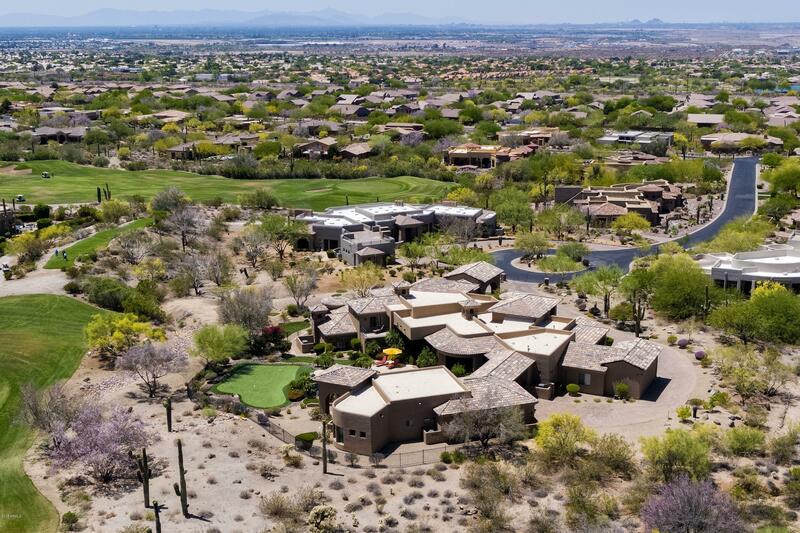 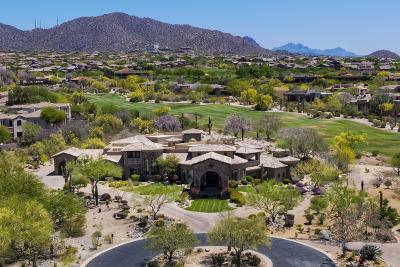 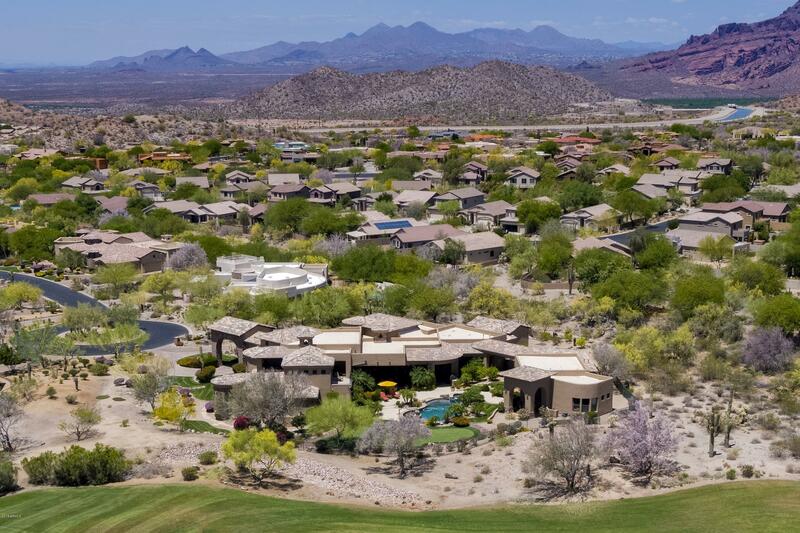 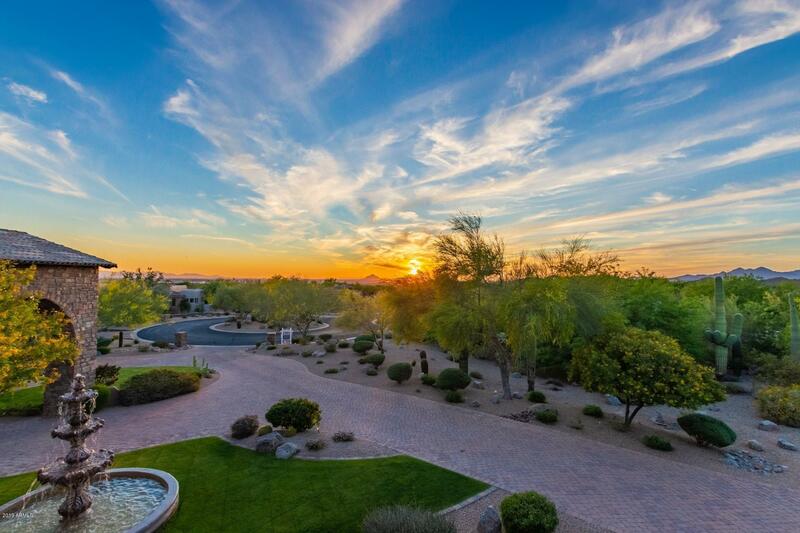 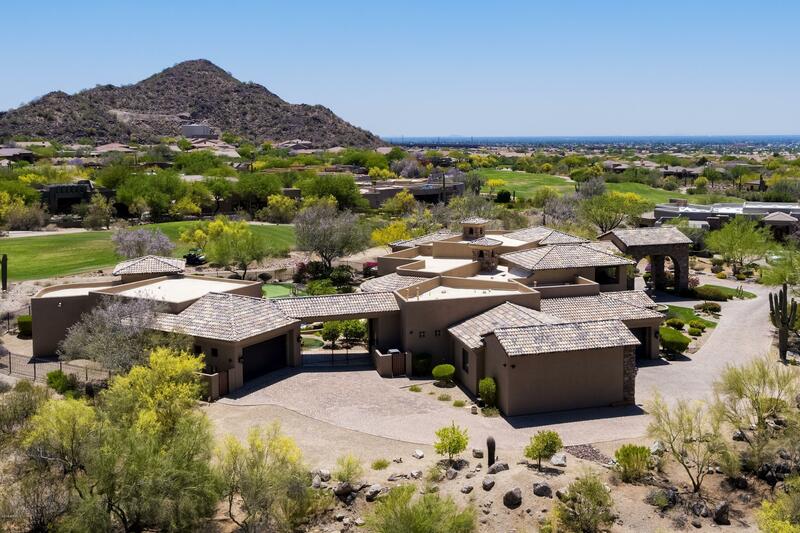 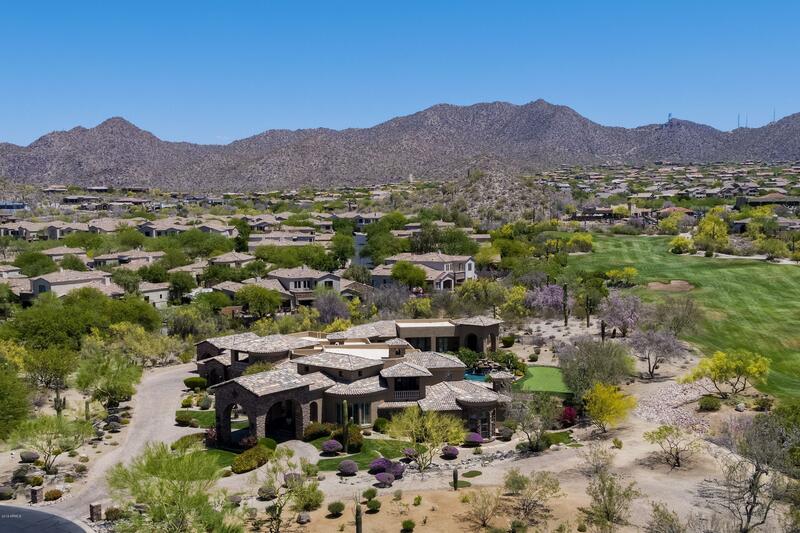 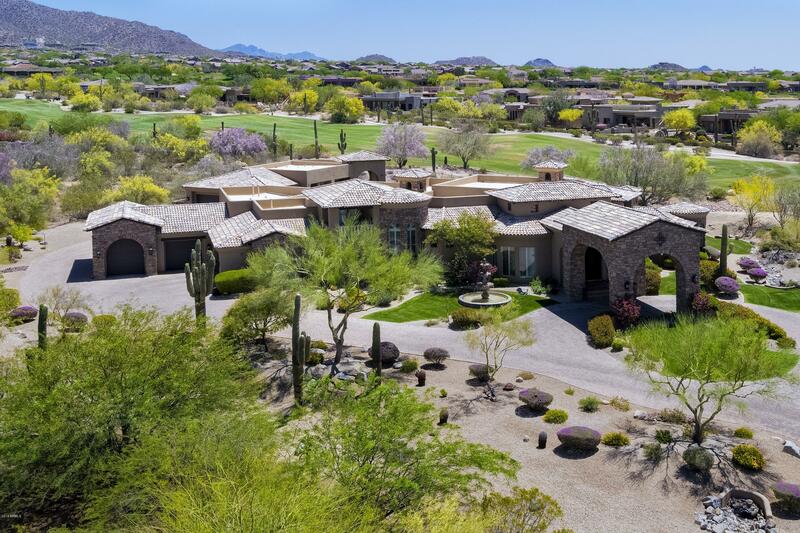 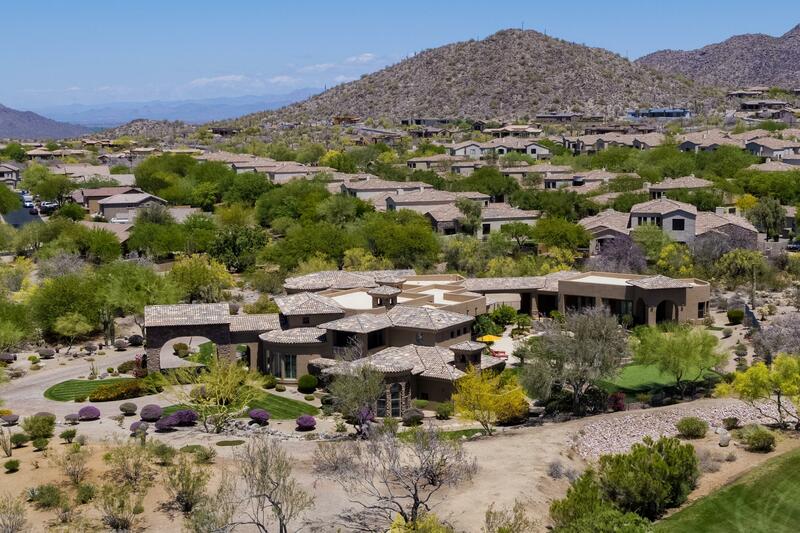 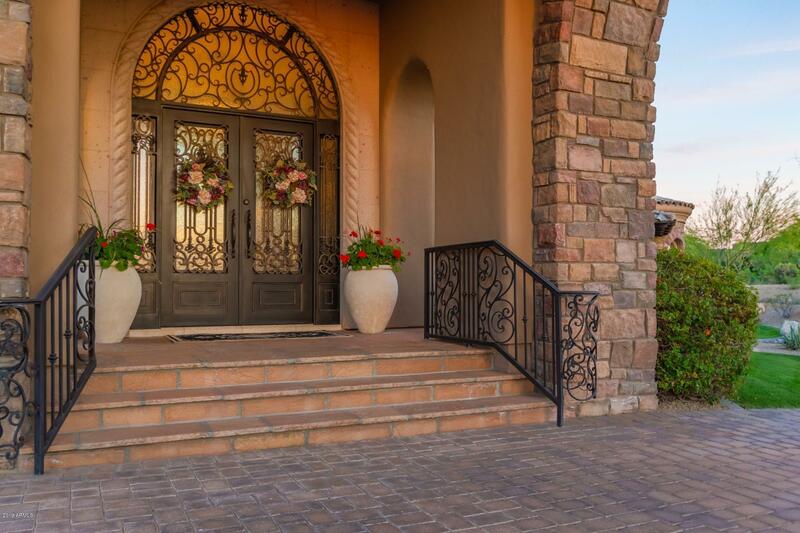 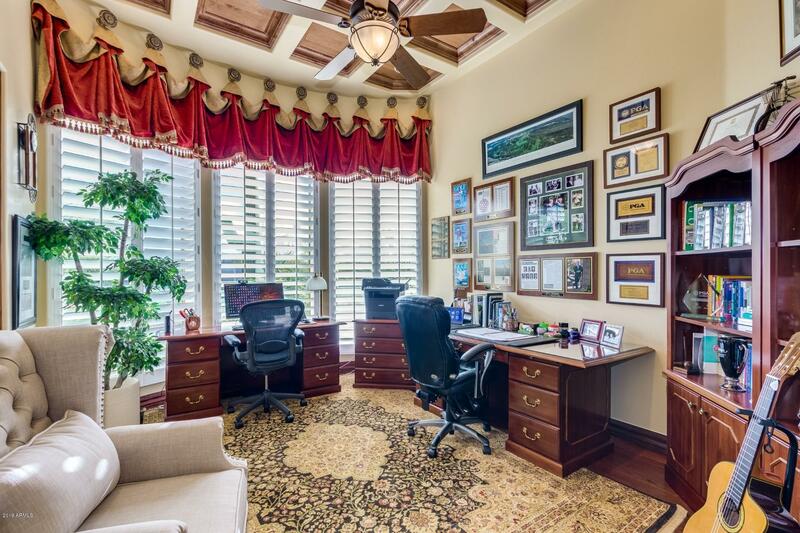 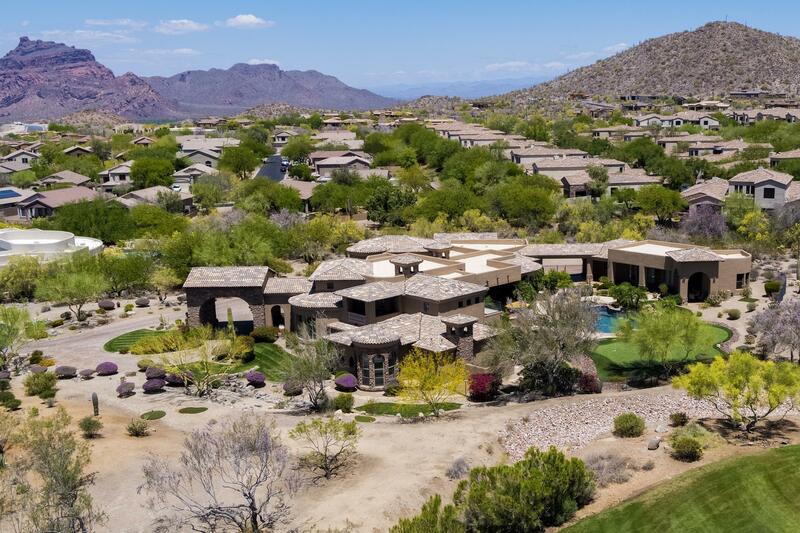 Nothing Compares to this stunning ESTATE on 1.83 acres alongside the 9th fairway of Las Sendas Golf Course*CITY LIGHT VIEWS, MTN VIEWS & TOTALLY PRIVATE 2 ACRE LOT*This stunning estate offers 7,372 s.f.. of luxury w/award winning designed living space, MAIN FLOOR MASTER suite! 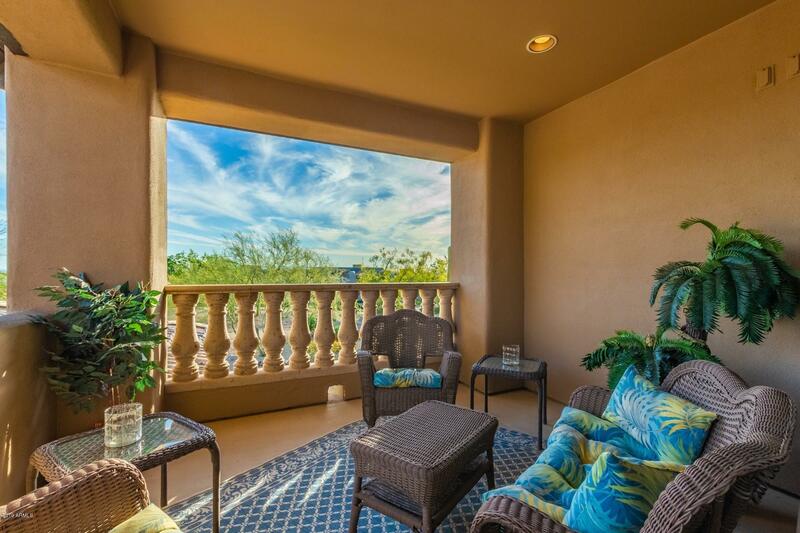 *Butted Glass windows view the tropical, resort-like grounds from kitchen/great room w/soaring ceilings*Walk out to over 2,200 s.f. 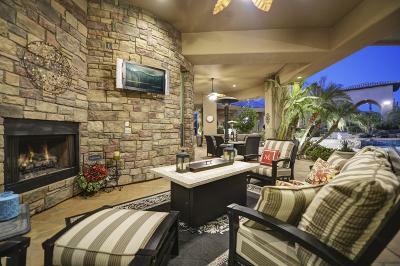 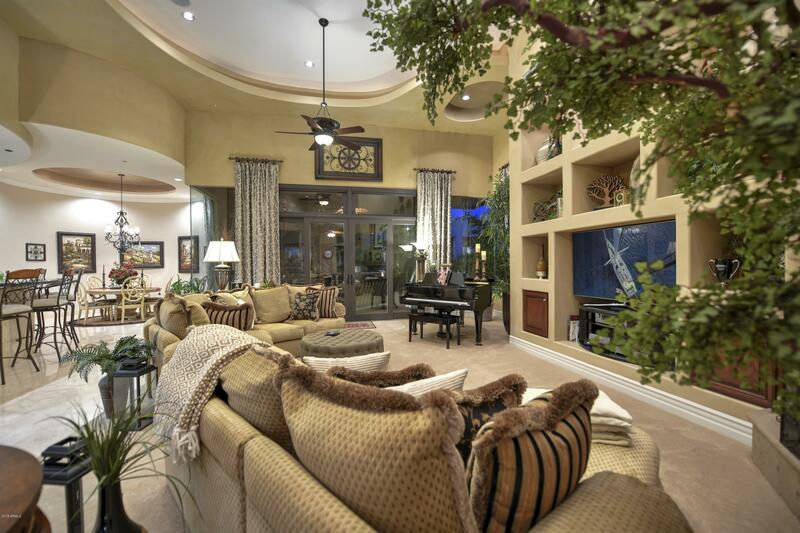 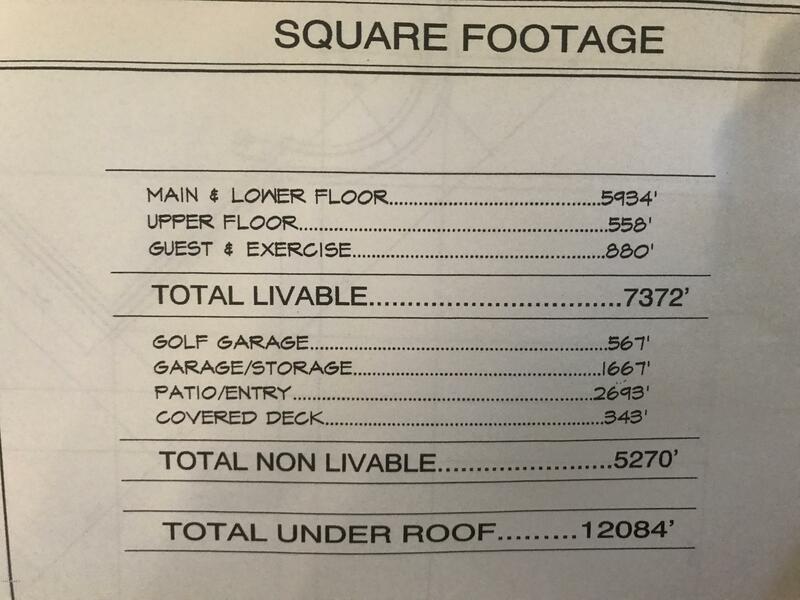 of Covered Patio for entertaining! 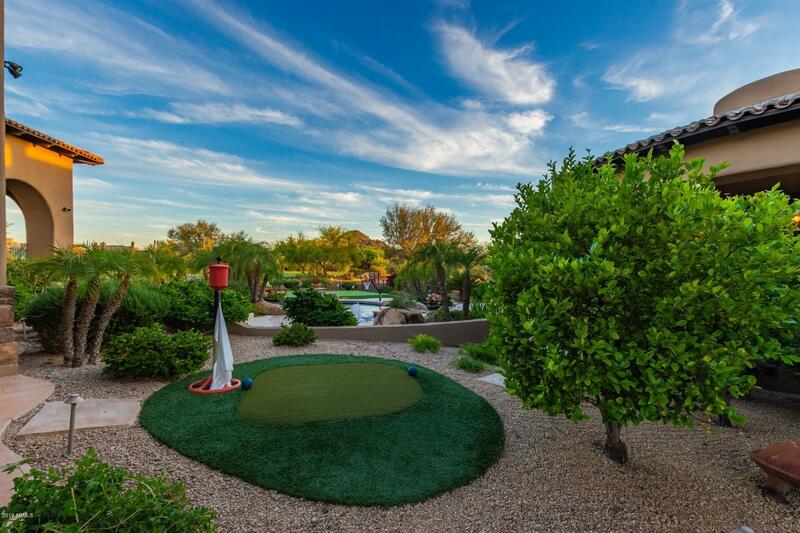 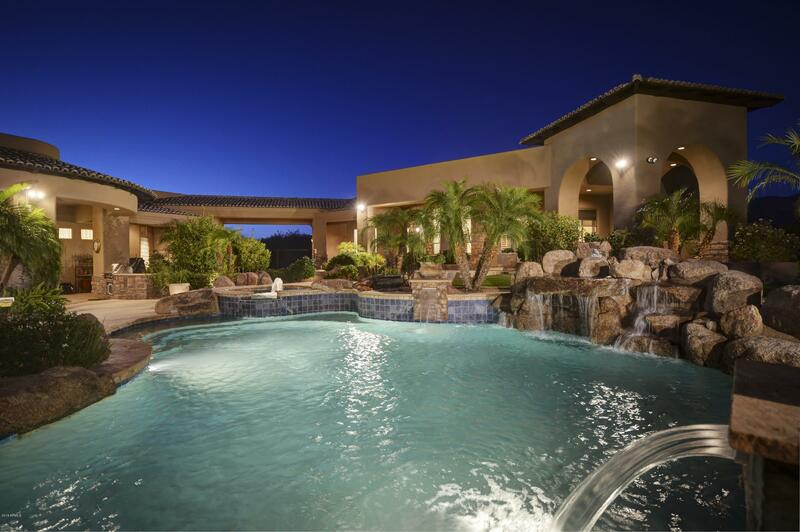 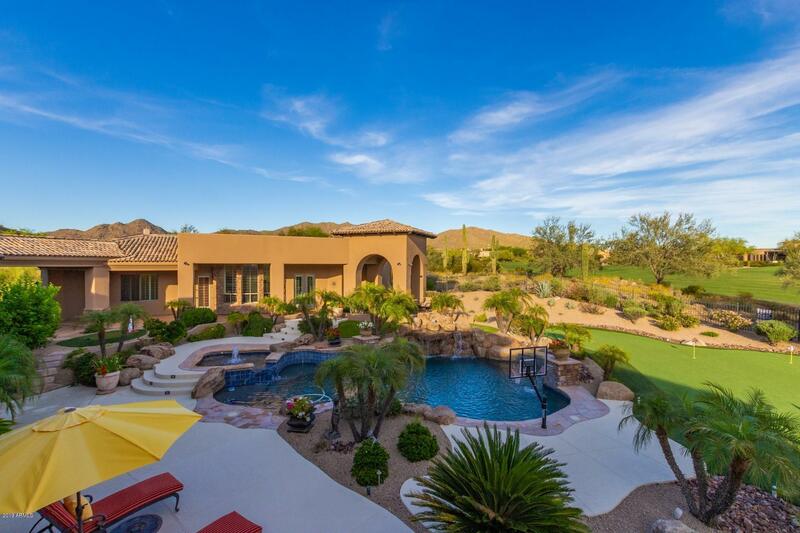 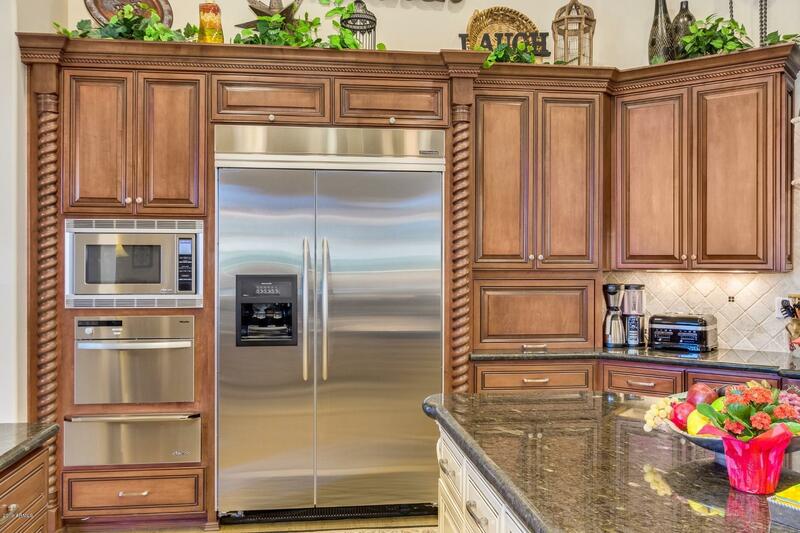 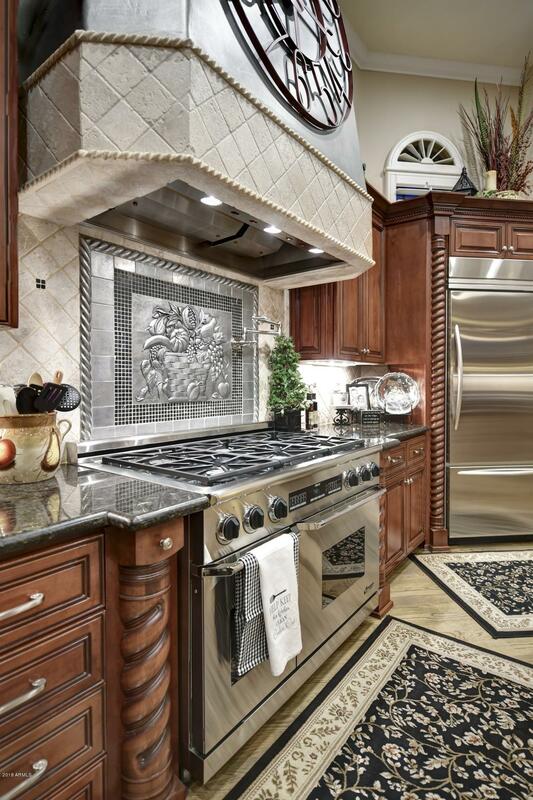 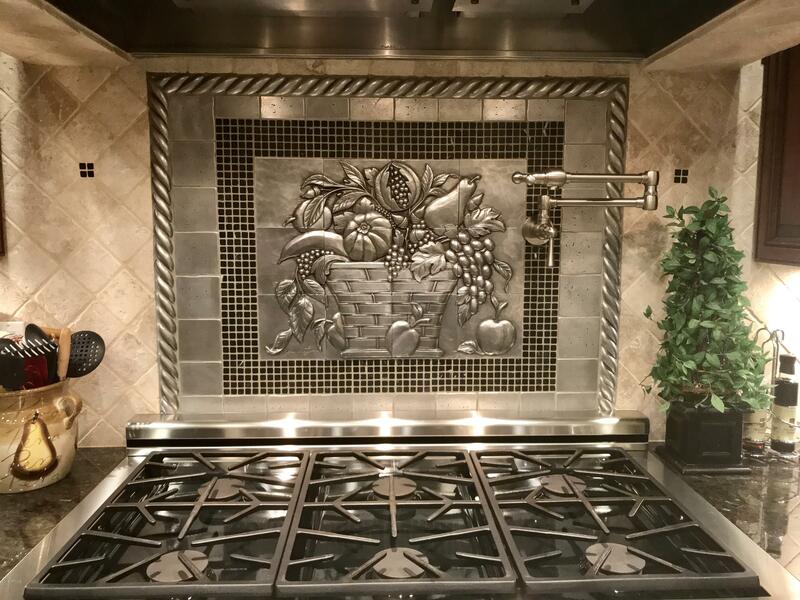 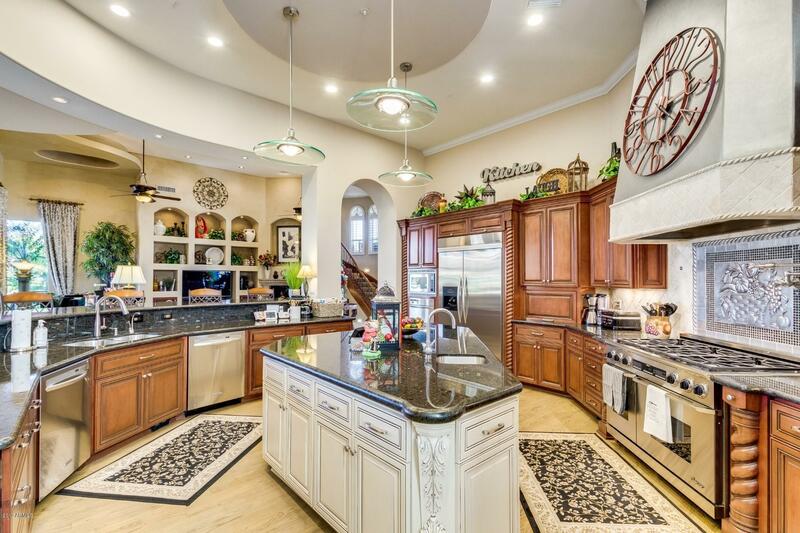 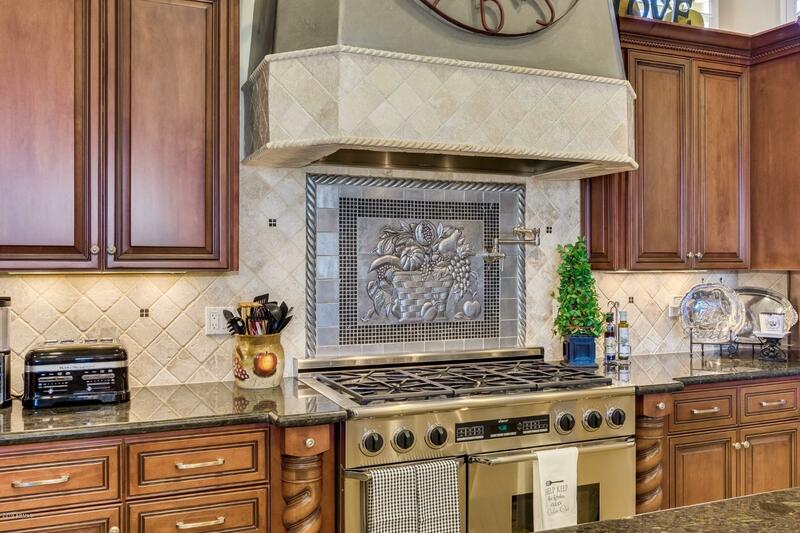 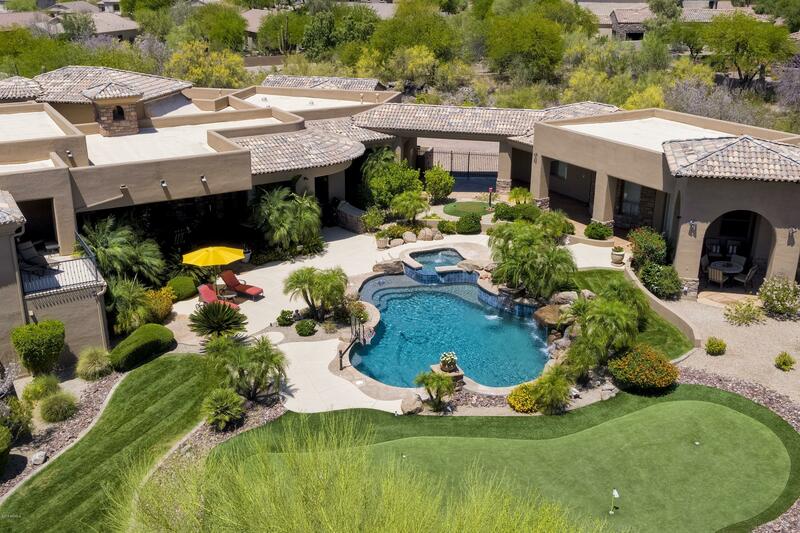 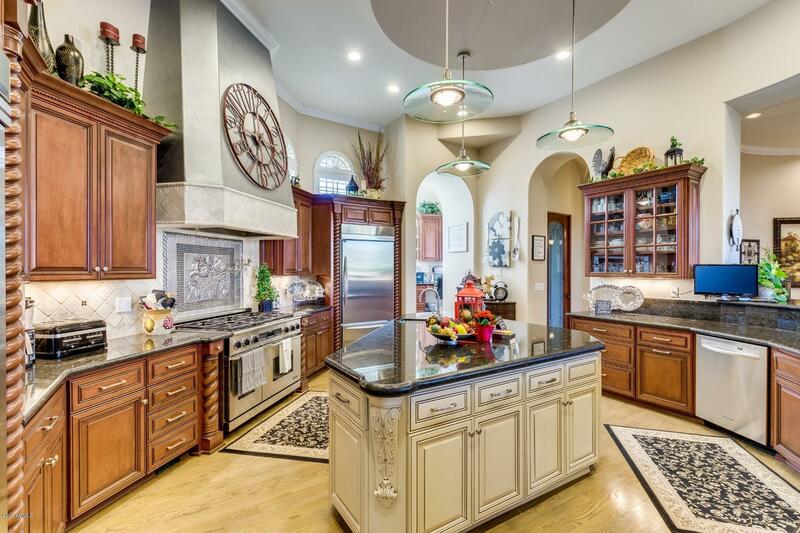 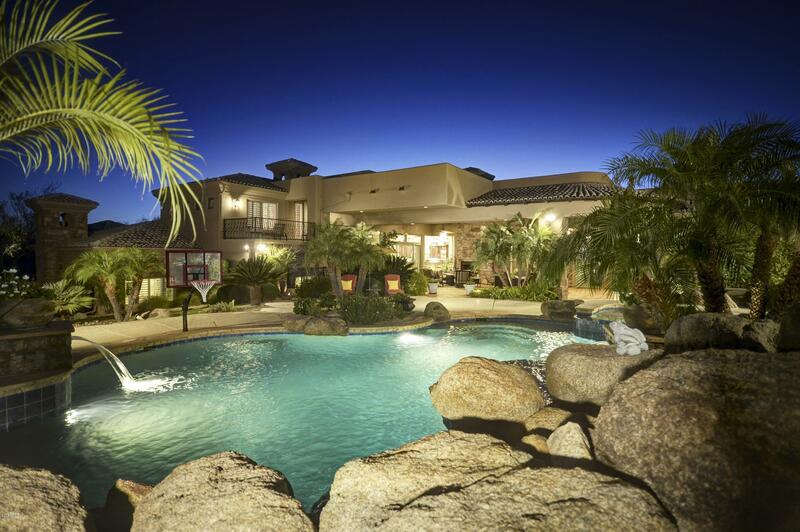 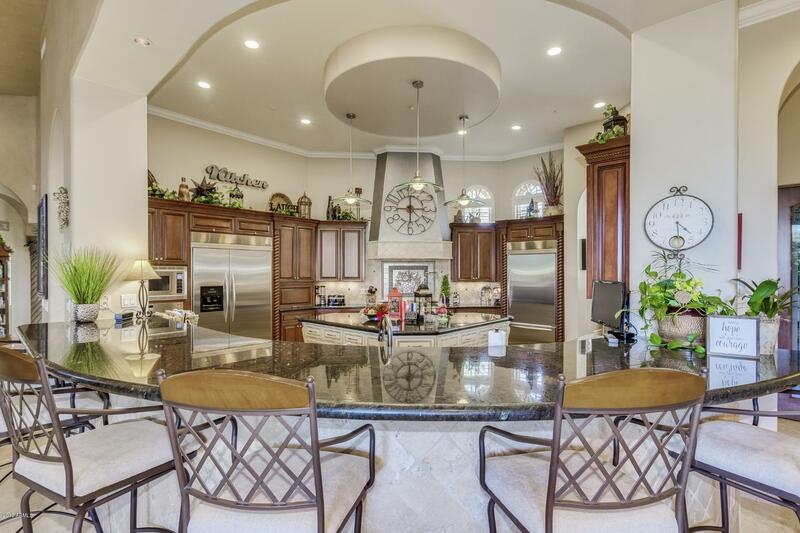 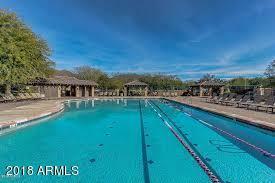 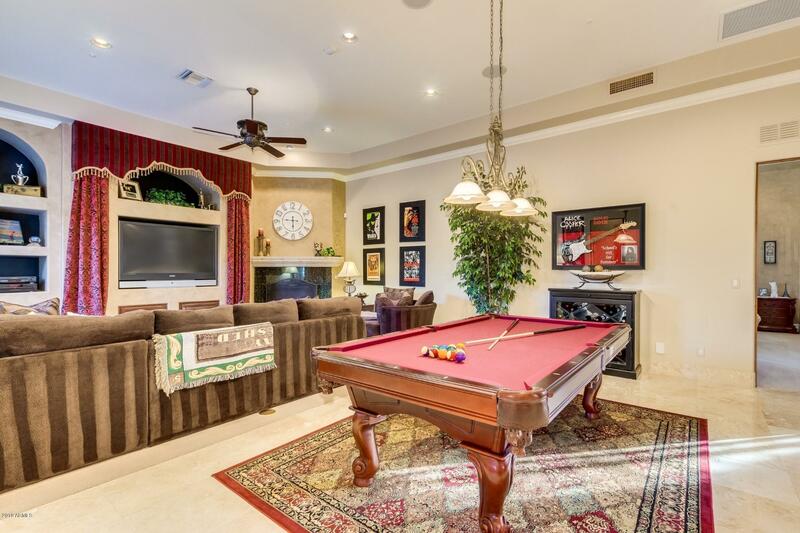 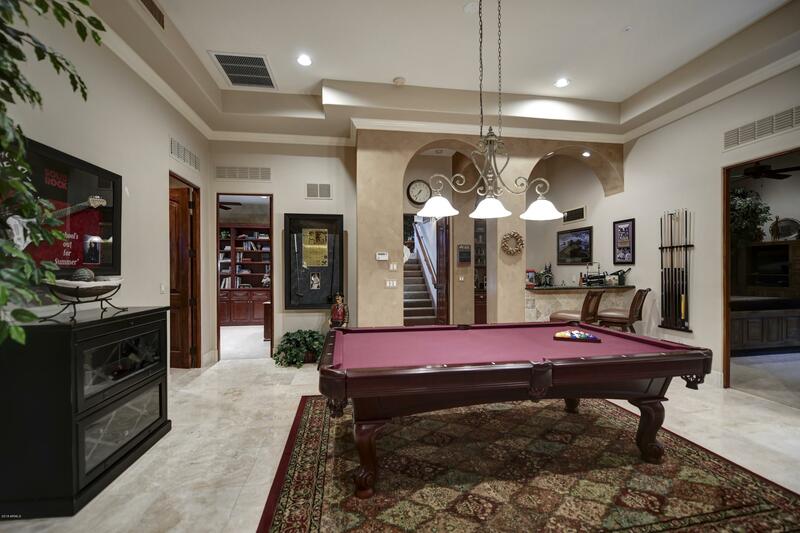 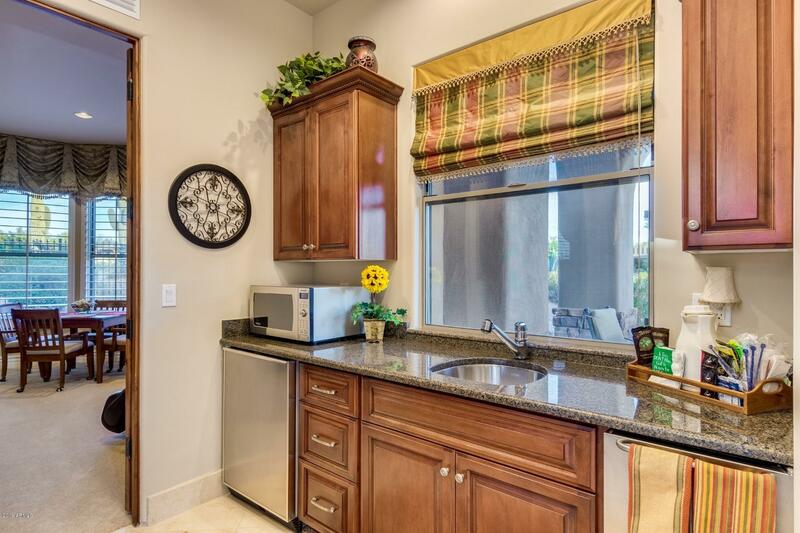 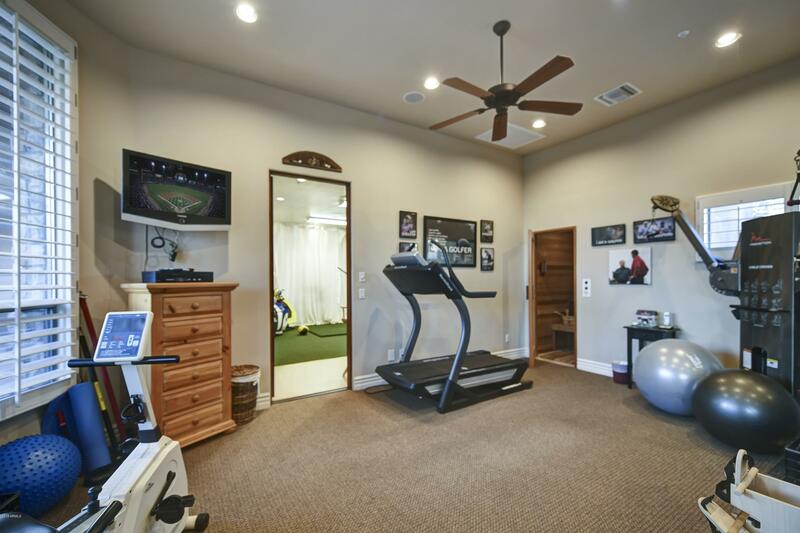 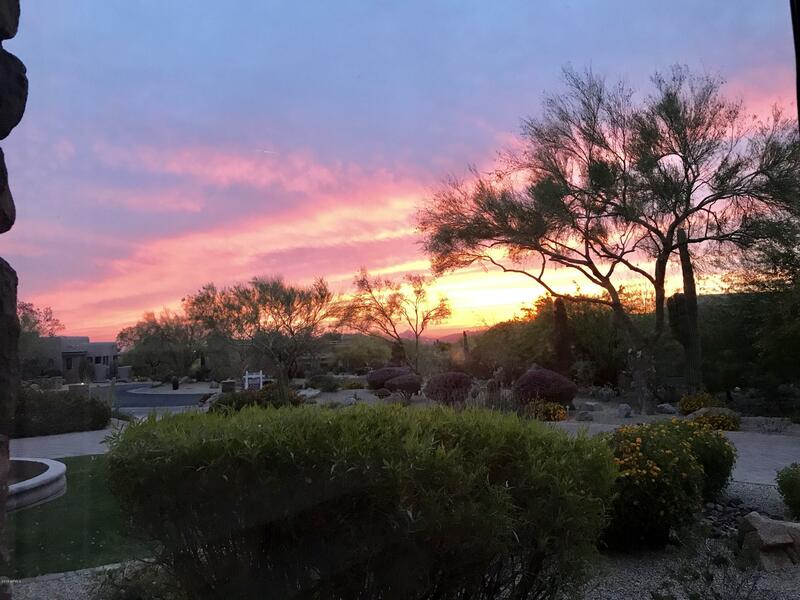 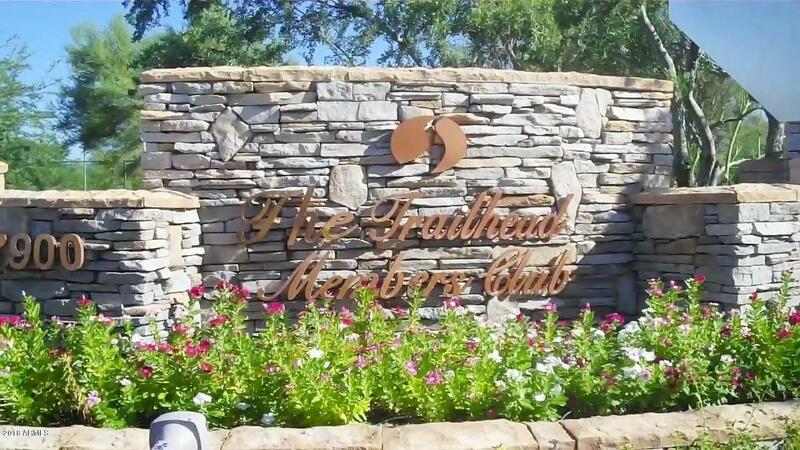 *Putt on your own 1,881 s.f..of Jack Nicklaus designed Putting Green*Heated Pool(w/2 swim jets), spa, & grotto*Chef's kitchen boasts 2 Kitchen-Aid refrigerators, 2 dishwashers,6-burner Dacor range, Miele Steam oven, 6-person bar surrounding the kitchen! 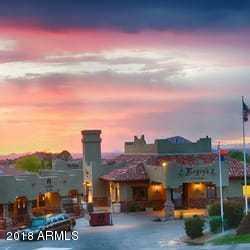 *Enjoy City light views from 2 offices, laundry room, formal dining room and 2 covered patio decks instead of an uncovered roof deck that has a huge potential to leak due to AZ Sun! 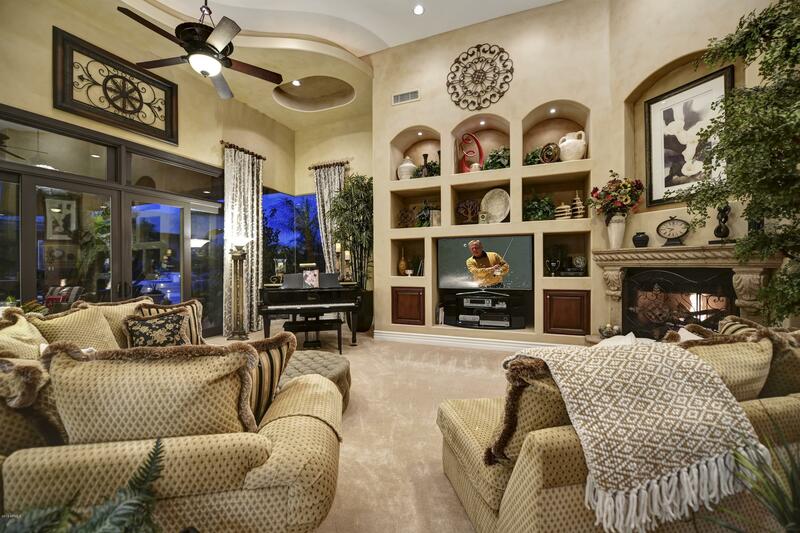 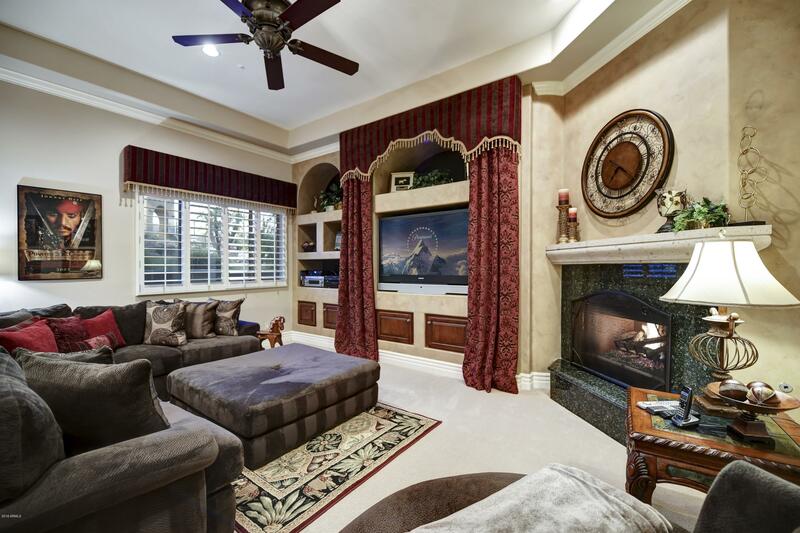 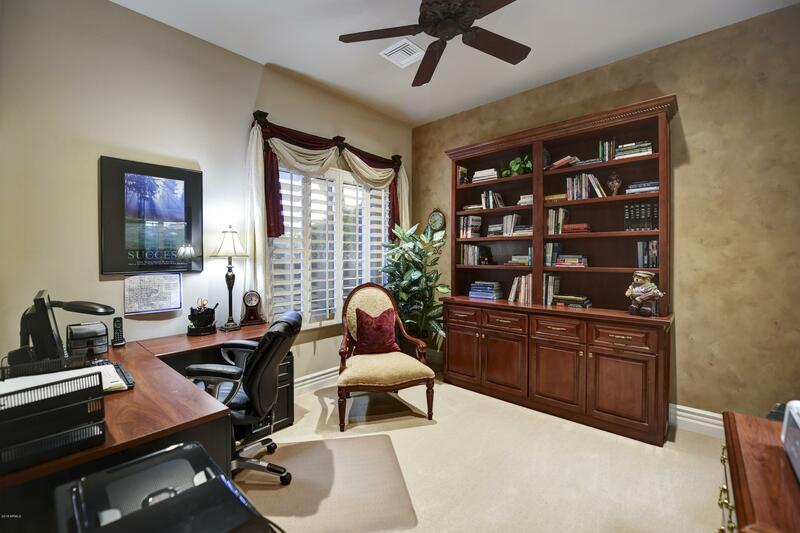 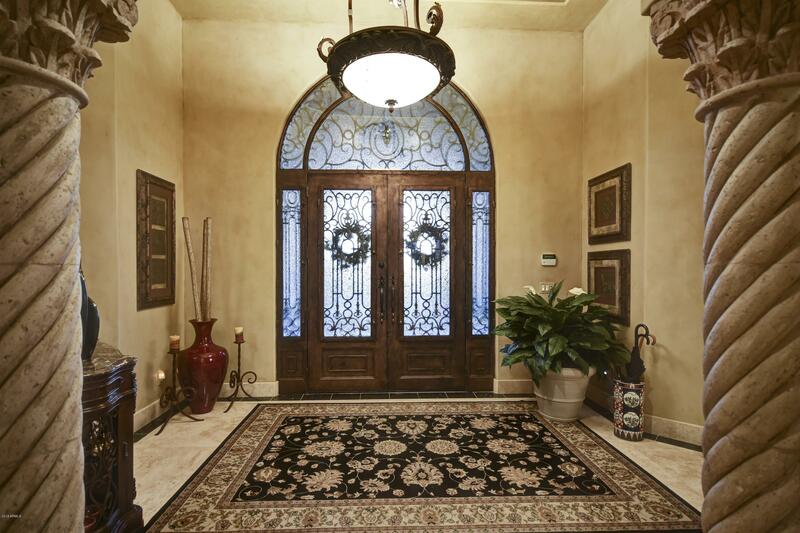 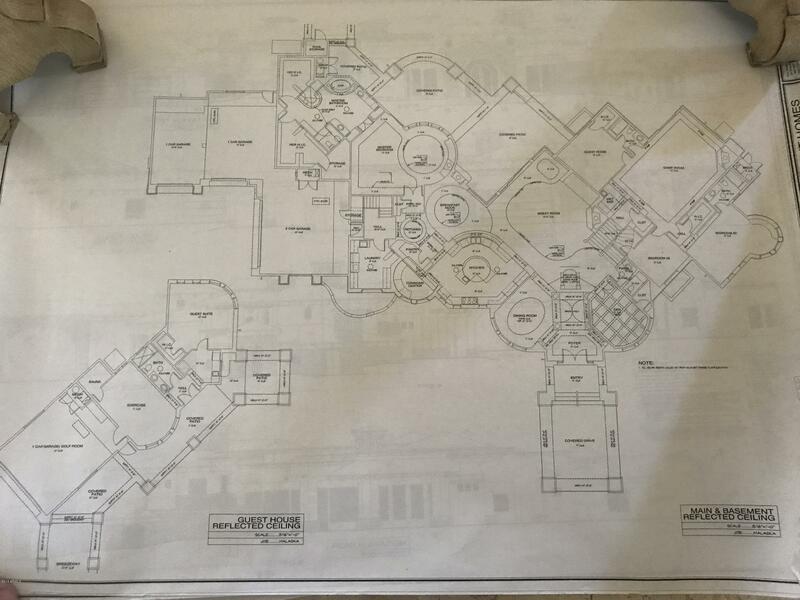 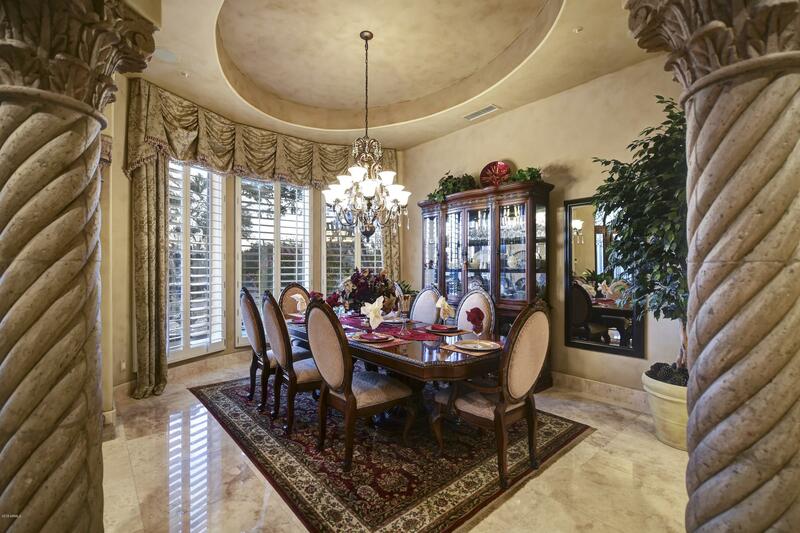 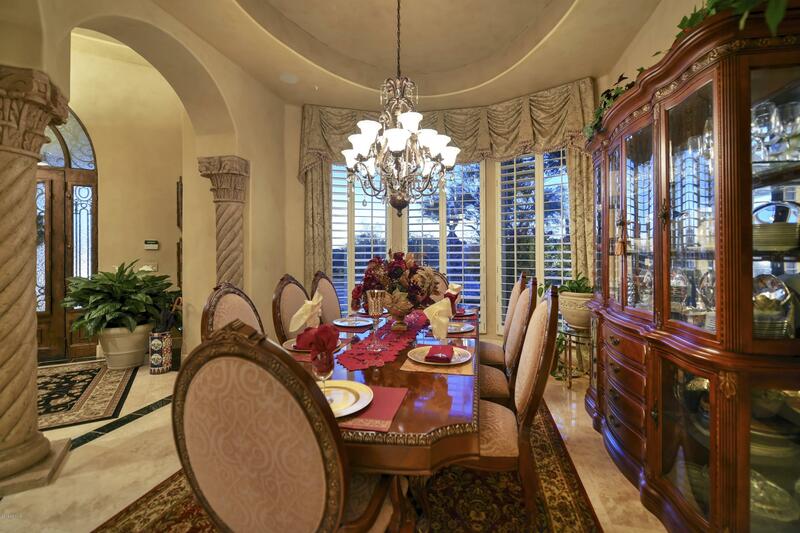 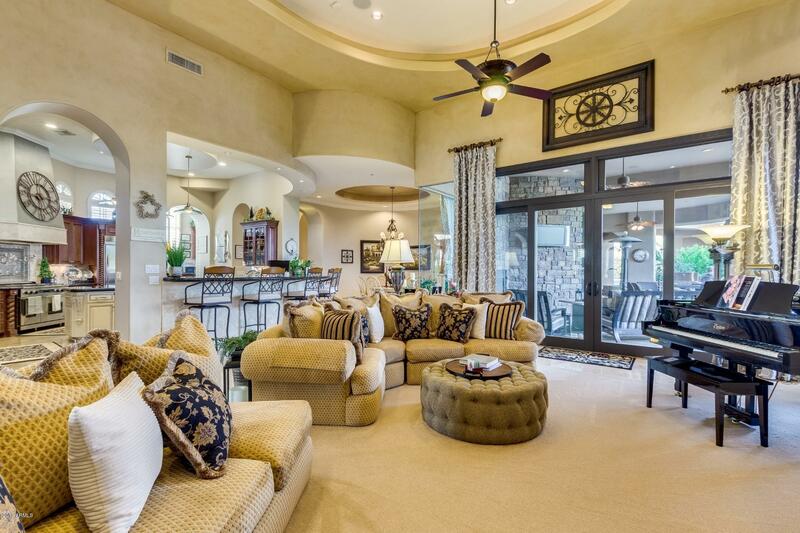 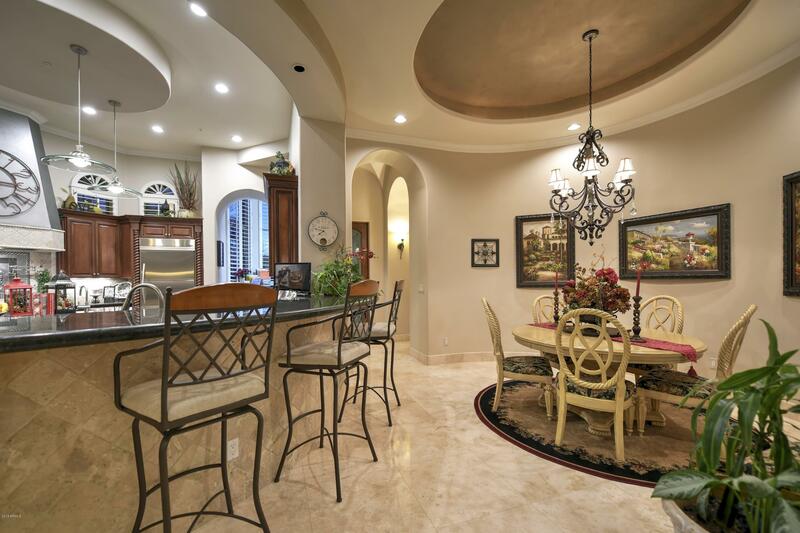 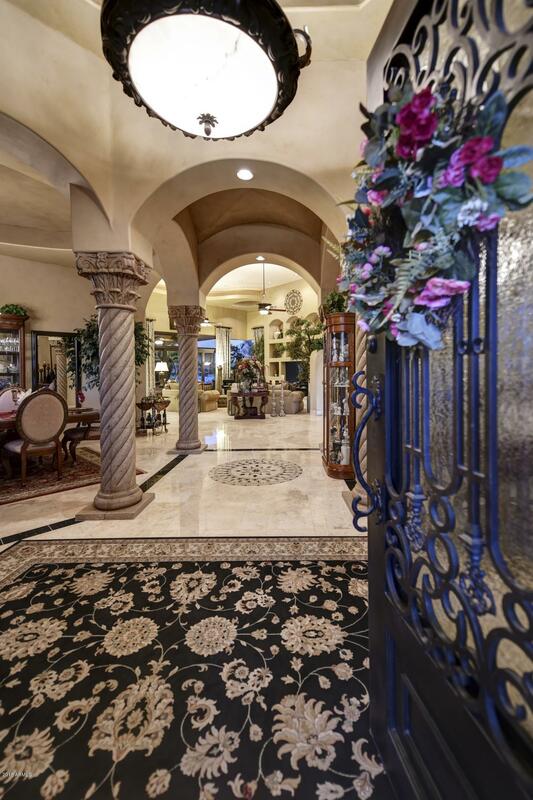 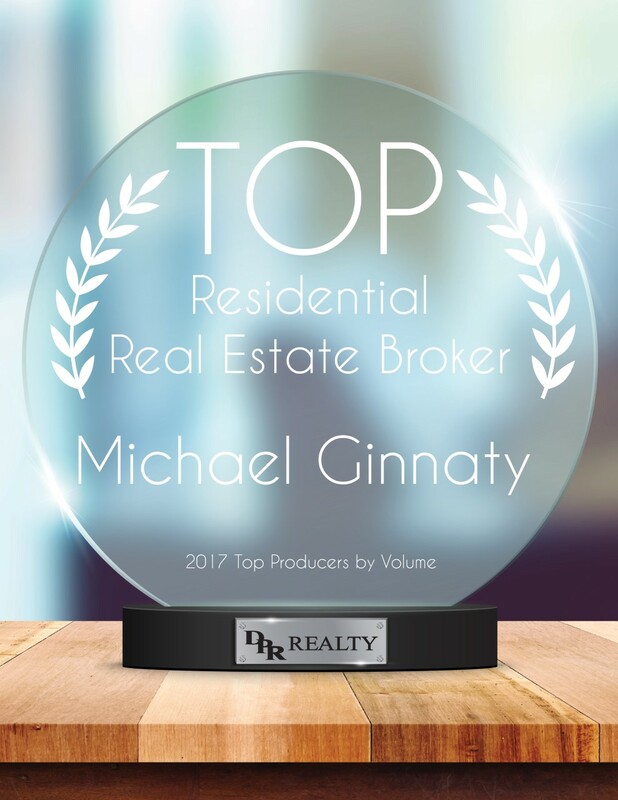 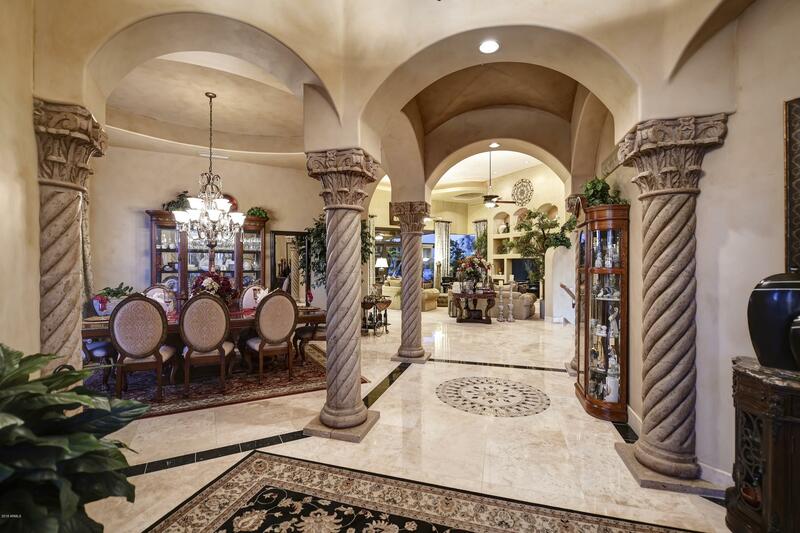 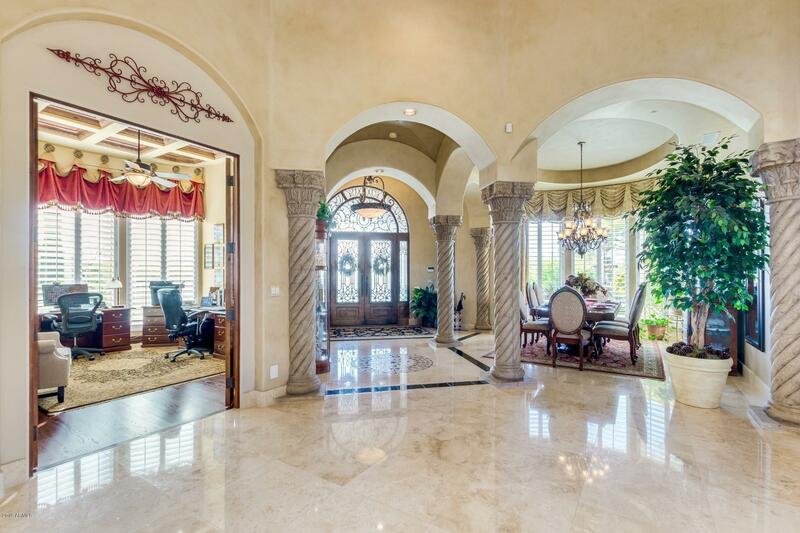 *Ceiling details include groin vaults and modern designs*Cantera stone hand-carved columns at entry and cantera fireplace*Main floor has great room, kitchen, 2 offices, 1/2 bath, master bed/bath, Laundry room, Formal Dining, & 4-car garage without any steps! 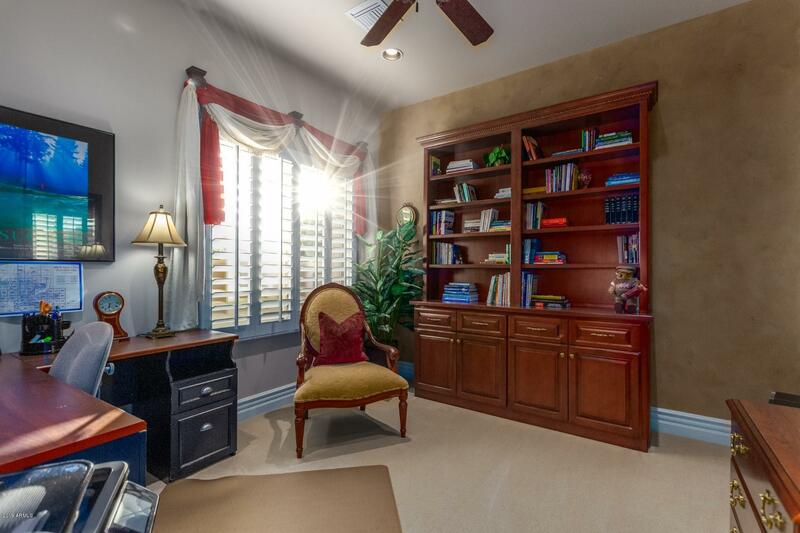 Amazing storage rooms to die for! 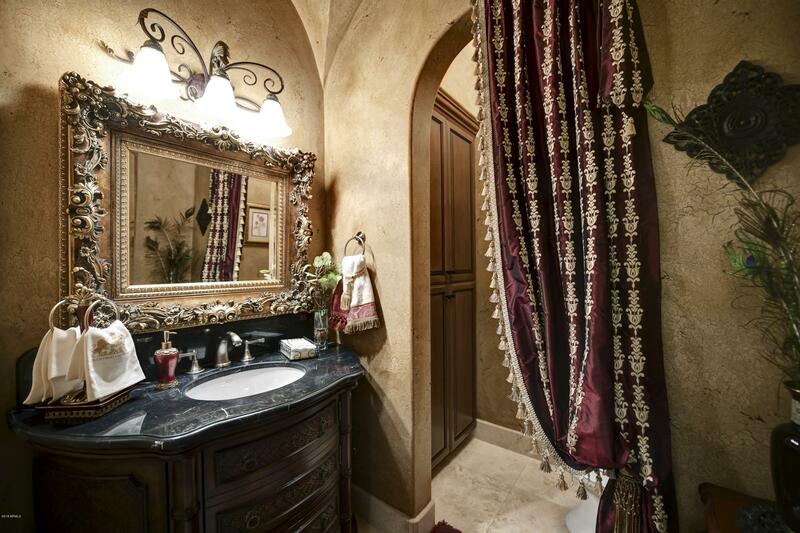 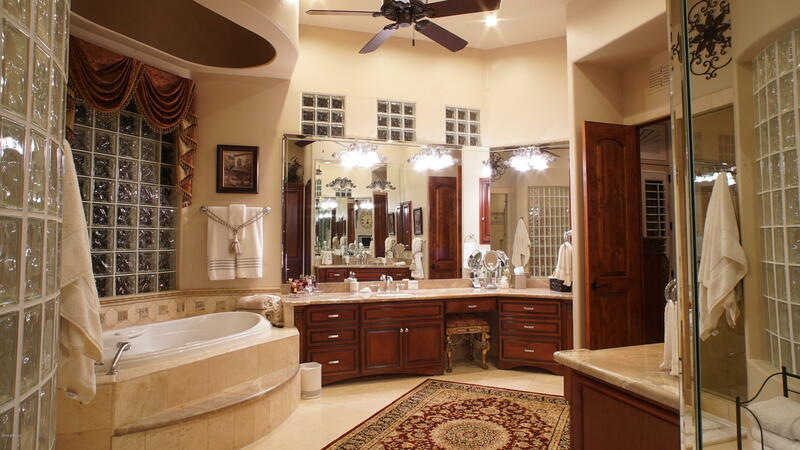 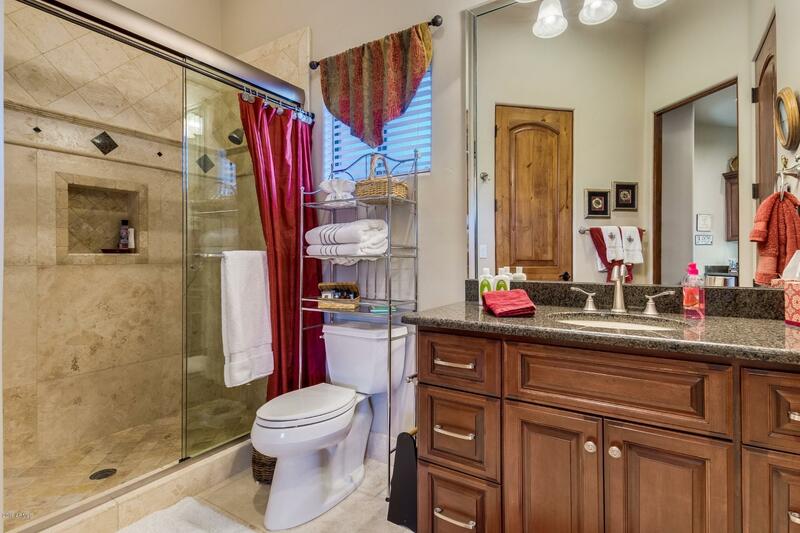 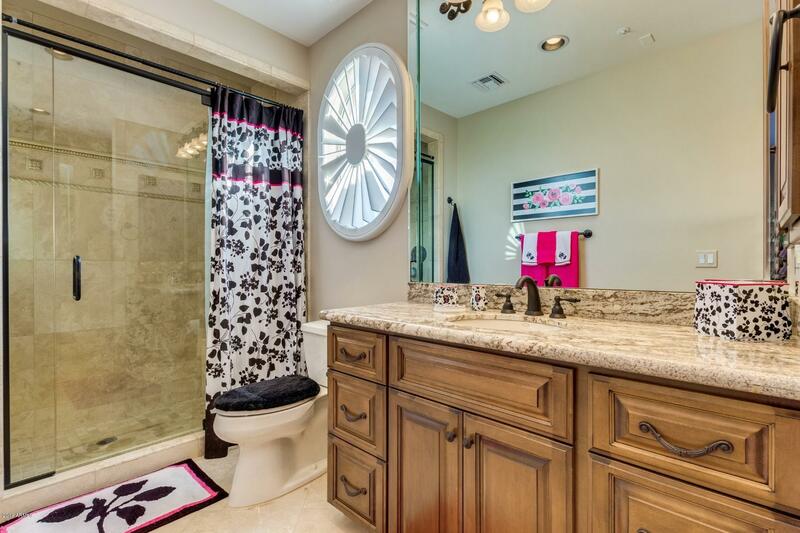 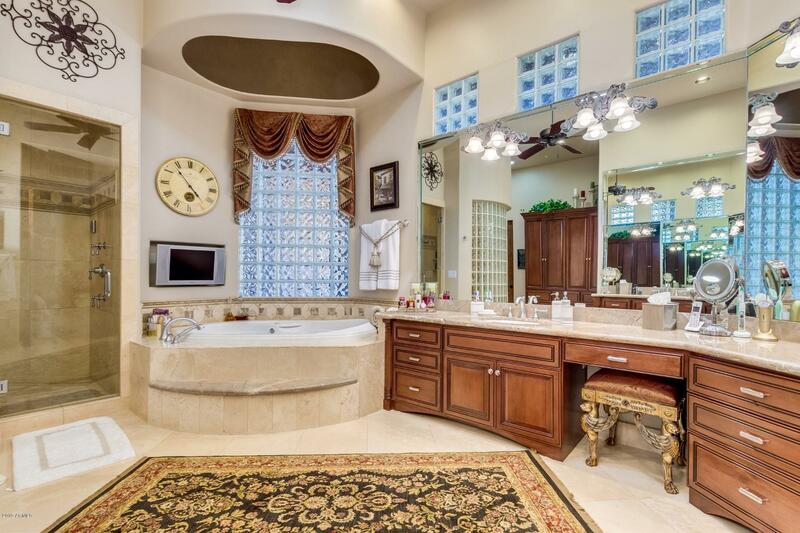 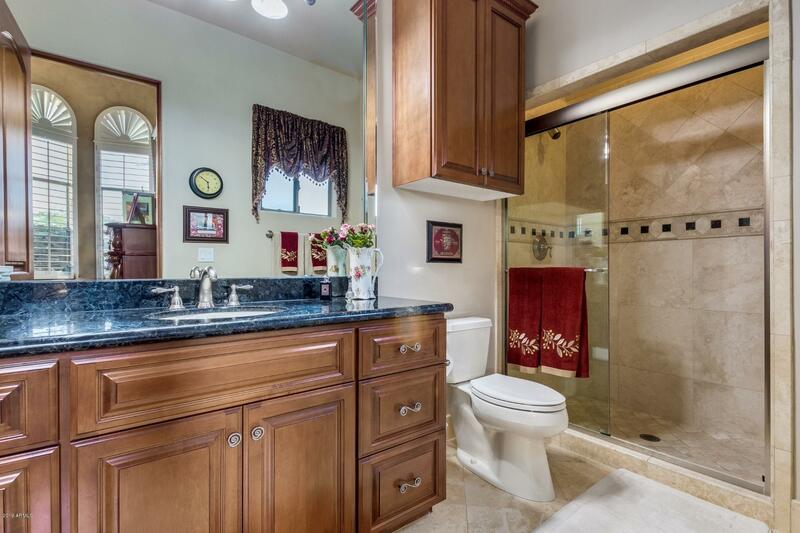 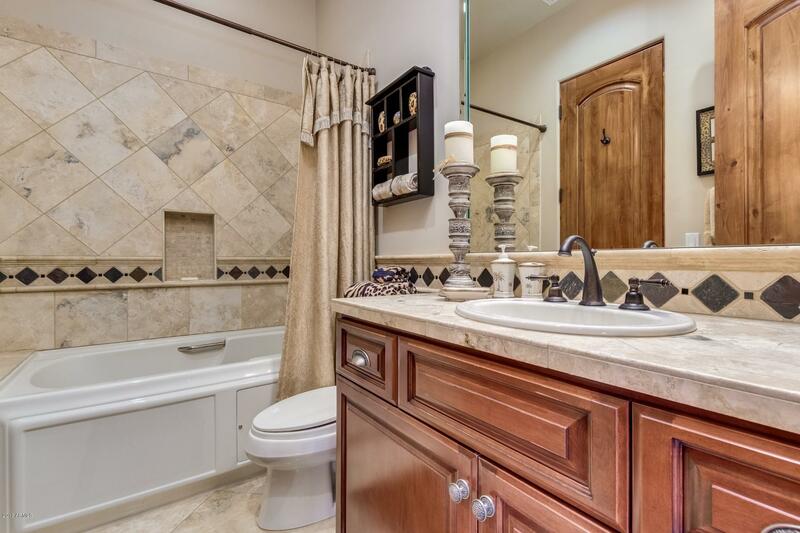 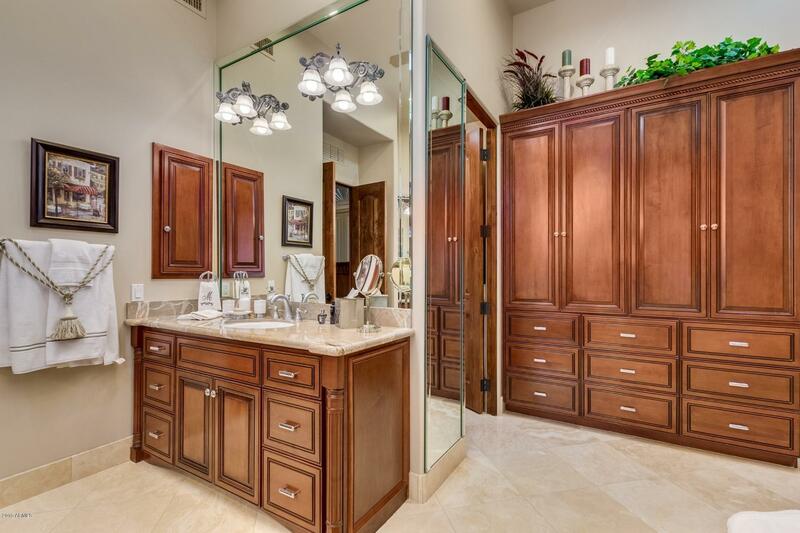 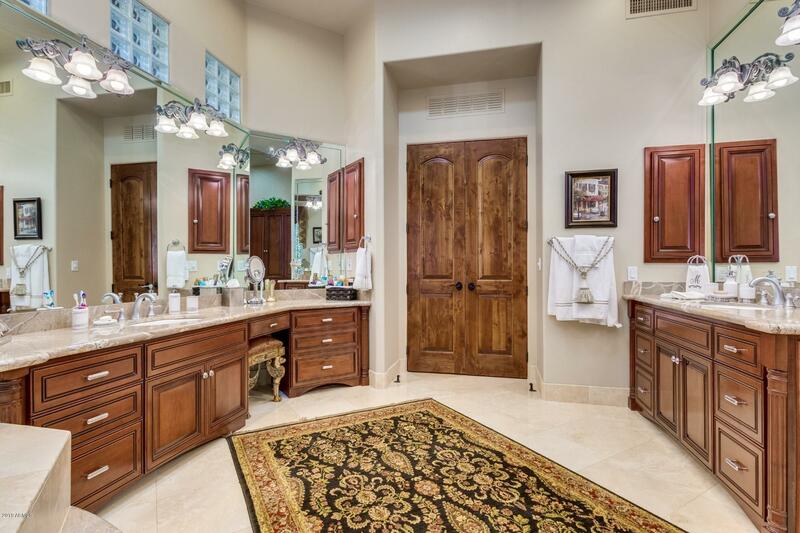 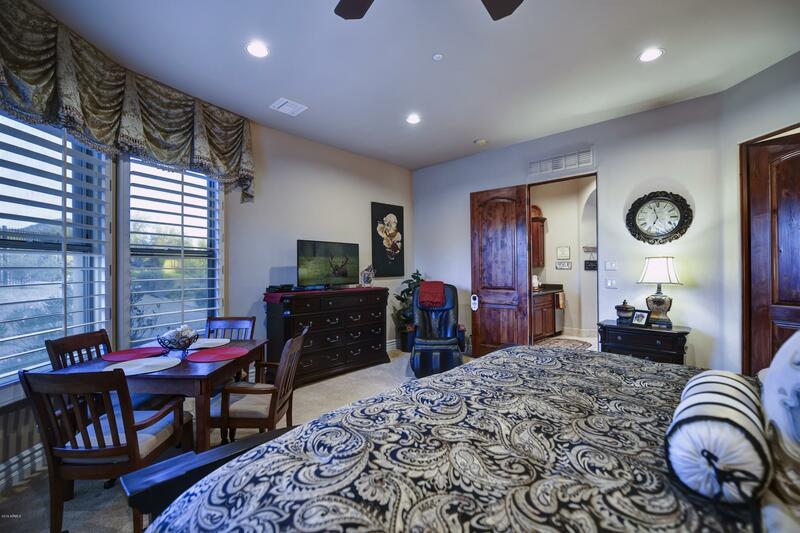 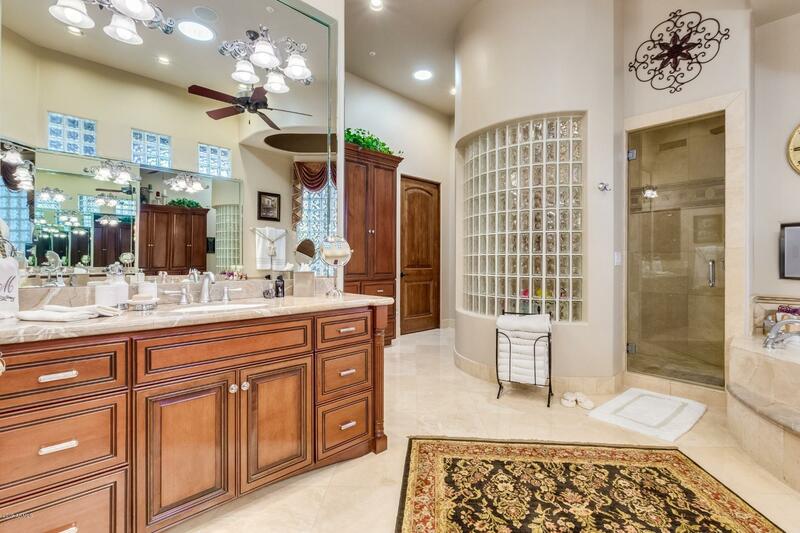 *Add to it the Elegant Main floor master suite w/sitting area and fire place*Master bath showcases marble counters, his/her sinks, "Jason" jetted tub w/mood lights*Steam shower is fit for the King and Queen w/body jets, rain head & two additional shower heads*Two large walk-in closets for his/her w/additional massive storage room*Opposite side of home you can drop down only 7 stairs to 3 cooler bedrooms, 2 full baths (one with jetted tub) and an additional bedroom currently used for a 3rd office w/built in cabinetry*Amazing game room/media room w/fireplace to take up a game of pool or watch your favorite flick! 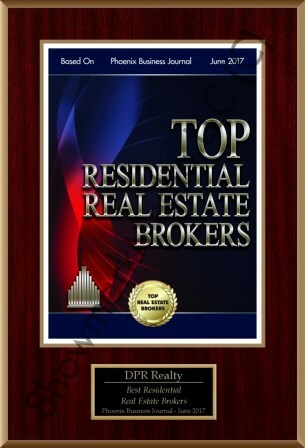 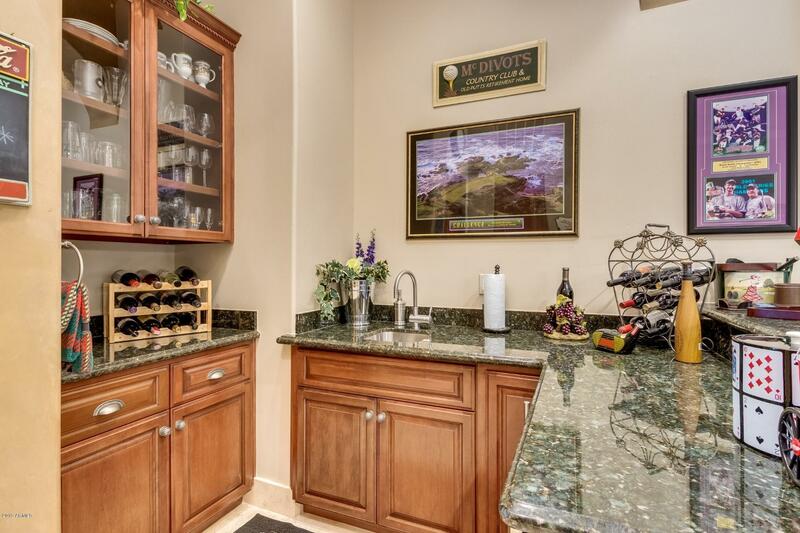 *Wet bar down with GE Monogram Wine refrigerator*Upstairs 5th En-suite bedroom also offers 2 private balconies for the prince or princess with expansive city light views to west or Mtn./golf course views to the east! 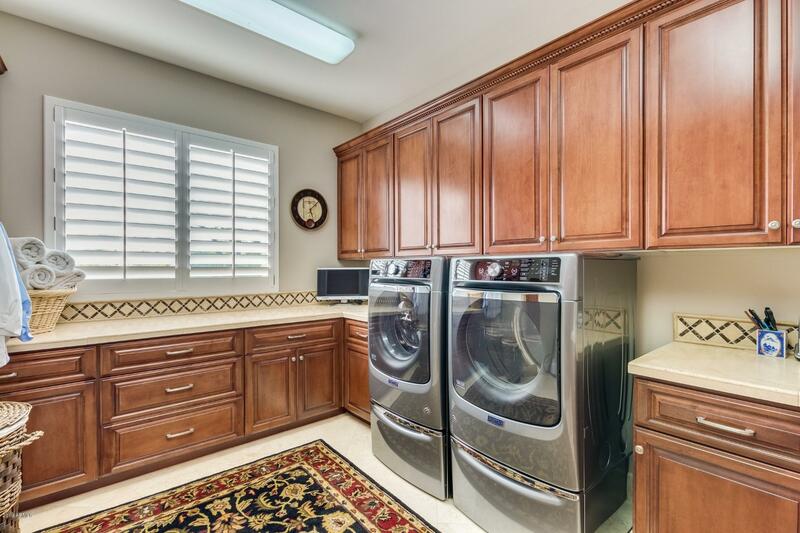 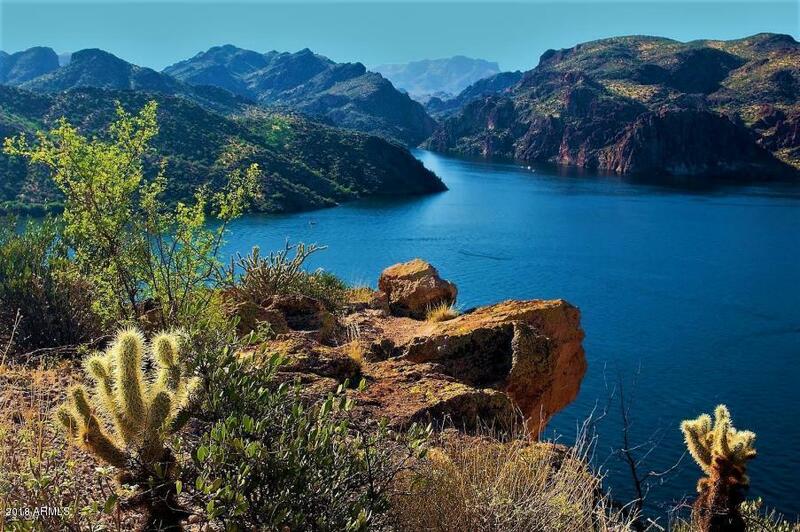 *Follow the covered breezeway to the fully contained 1 bedroom/bath Casita guest house*Full kitchenette,w/microwave/bar size refrigerator, & full size laundry, Exercise Room + 4 person sauna! 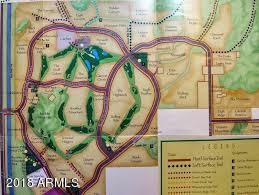 *Finish off this area with a 2-car garage or keep it as an indoor golf driving range (or batting cage) currently used by a professional golfer*This is a MUST SEE as there are too many amenities to mention*Meticulously maintained* must see HOME FEATURES LIST in Documents tab and floor plans* Las Sendas is a premier master planned community offering healthy lifestyle opportunities, multi-generational activities and superior services to homeowners in a comfortable, beautifully-maintained desert environment with scenic mountain and valley views.